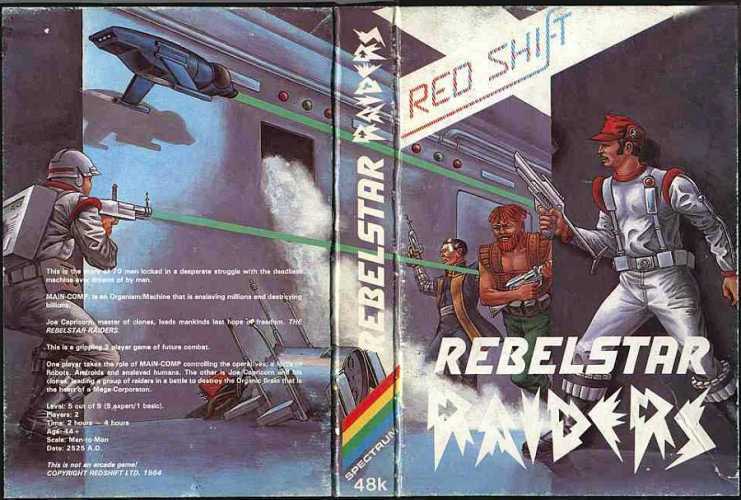 Rebelstar Raiders was originally released for the 48k ZX Spectrum in 1984 by Red Shift Ltd.
Rebelstar Raiders was a two-player game. It included three different scenarios. The first scenario, Moonbase, is the beginning of a story line that runs through the whole series. The Raiders are attempting to destroy a vast organisation based on a planet called Pi. Before any of the Raiders ships can land on Pi, the planetary defences on the moon, Spyder, must be destroyed. One player controlled a squad of Raiders led by "the first of the Capricorn clones", Joe Capricorn. The moonbase, which is disguised as a mining station, is defended by sentry robots, mining robots, auto-guns, technicians and security guards. The Raiders win if one unit can get to the control room and destroy the sensitive equipment there. In the second scenario, Starlingale, Joe Capricorn and a few other survivors have returned to their escape vessel. The ship is still undergoing hull repairs, and must be defended for 12 turns. The Red Shift player, controlling various robot operatives, must destroy the two Navcomps on the bridge to prevent takeoff. The third and final scenario, The Final Assault, has the Starlingale join the Freedream on the surface of Pi. The Raiders must destroy eight parts of the Main-Comp in an underground shelter. 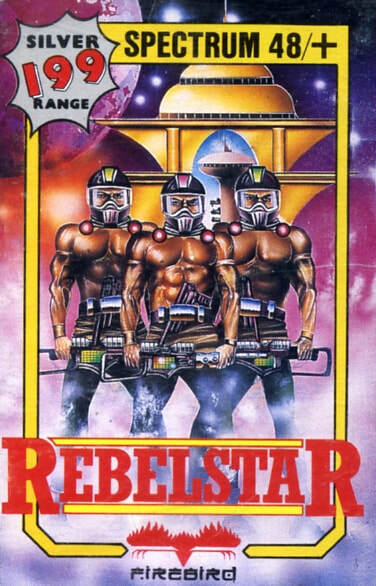 Rebelstar was originally published in 1986 by Firebird. 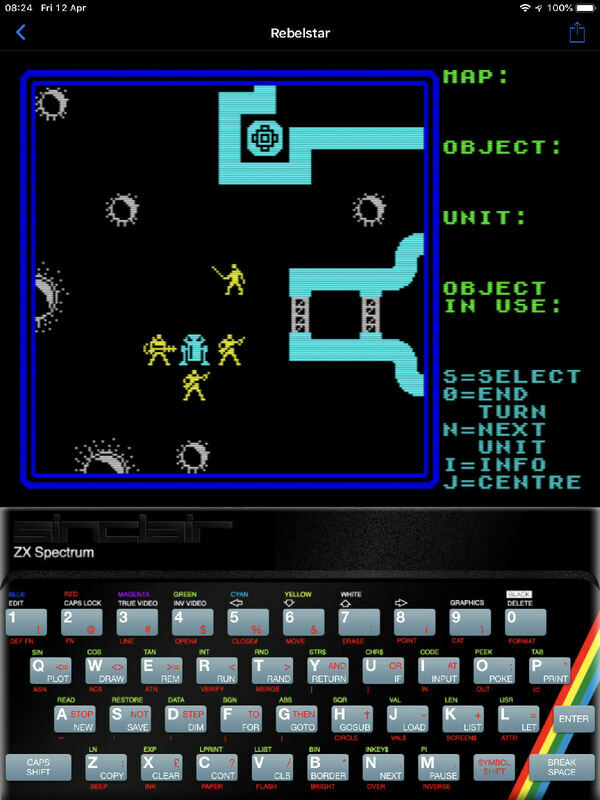 The game supported single player and two player variants. Only one map was available but it was a huge, multi-screen map unlike the single screen maps of Rebelstar Raiders. 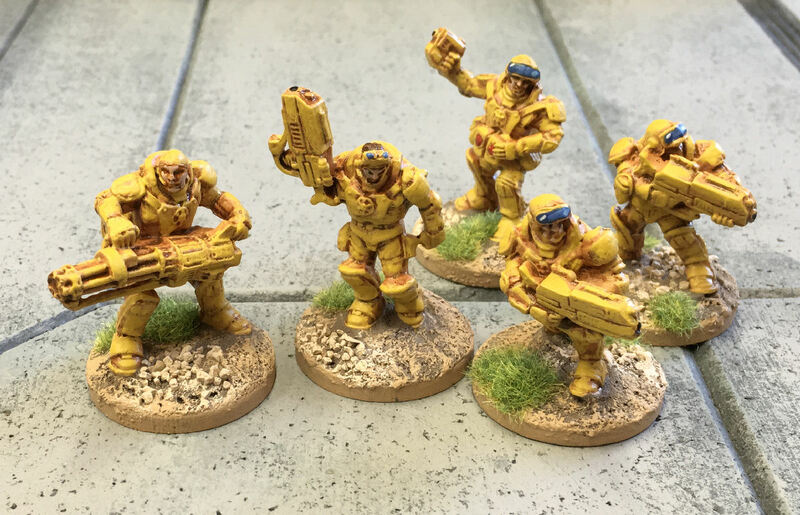 Morale, stamina and encumbrance were new statistics for units, and ranged fire had the option of fast snapshots or more action-point consuming aimed shots. In addition, an opportunity fire system allowed a player to interrupt their opponents turn with pre-targeted shots. 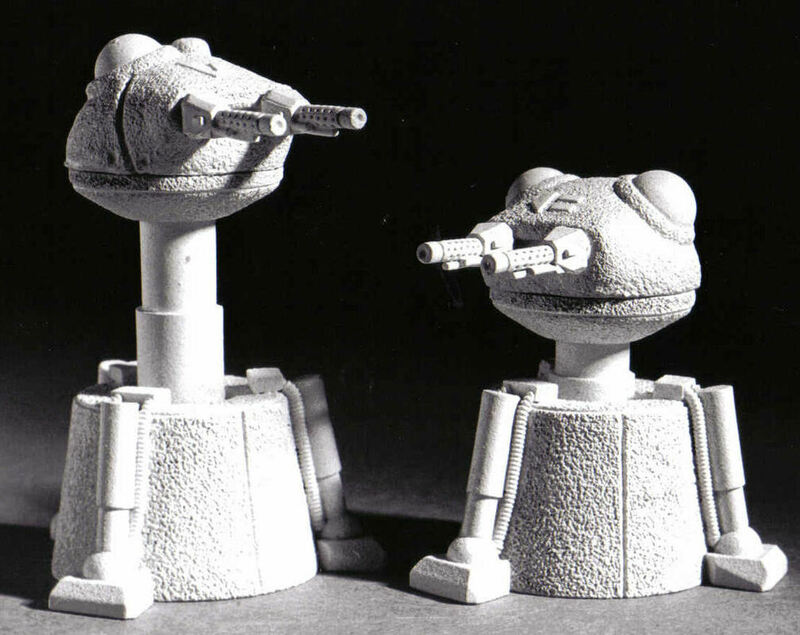 Objects were more interactive than in Rebelstar Raiders, with units able to drop or collect weapons, ammunition, dead bodies, and other items. The objective for the Raiders in Rebelstar is to destroy ISAAC, the computer responsible for breaking the Raiders' secret codes. The game can be won either by destroying ISAAC's central core, or by eliminating all enemy forces in the base. 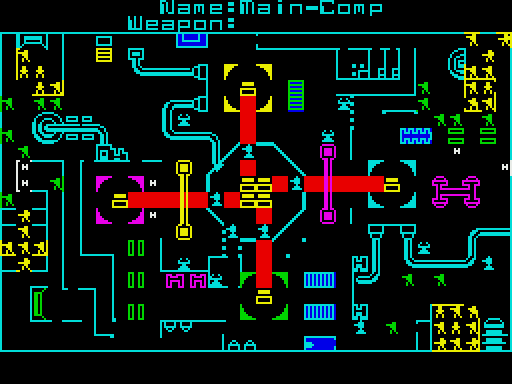 The player could gain reinforcements by destroying three Laser Defence Computers located around the base; this allowed reinforcements to arrive a few turns later. 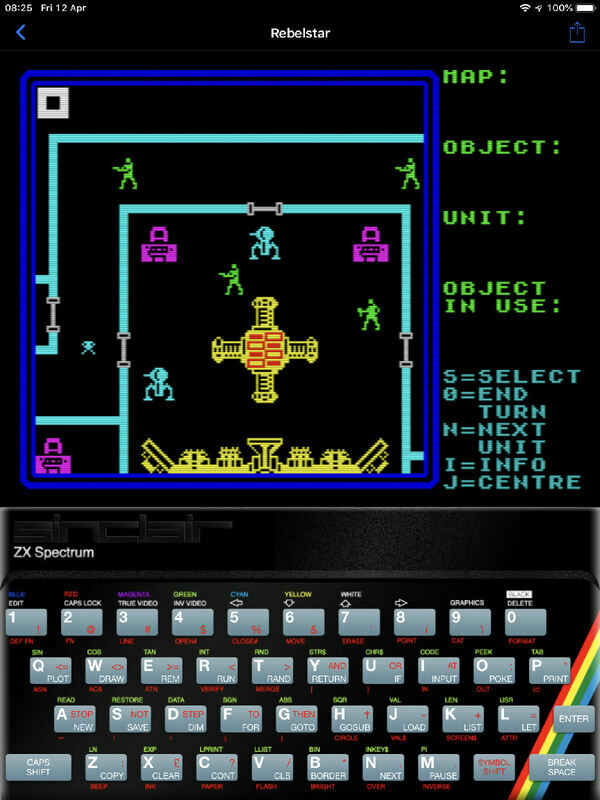 After this came Rebelstar II, an Aliens clone and then Laser Squad for 8-bit and 16-bit machines. None of these games captured the feel of the original Rebelstar games however so I won't be using them as inspiration for my project. I want to have a game where raiders attack a Moonbase. I'm after the feel of the Rebelstar games but not their crunch which was handled well by the computer but would be a pain in a modern tabletop game. I want to include the things that made the games such fun. Action Points, an IGOUGO system mitigated by the opportunity fire mechanic, interaction with the environment, a certain randomness to the set up and multiple mission choices for both sides to keep the replay value high. I want to design different missions too, to shake things up a bit and add in some of the narrative thread from Rebelstar Raiders. Also, unlike the original Rebelstar, the vehicles will be driveable! I am going to use my existing interior sci fi scenery that I developed for my Anarchy Offline Missions. I'm going to add five more tiles, two without walls and three with walls, to allow a three by five grid. 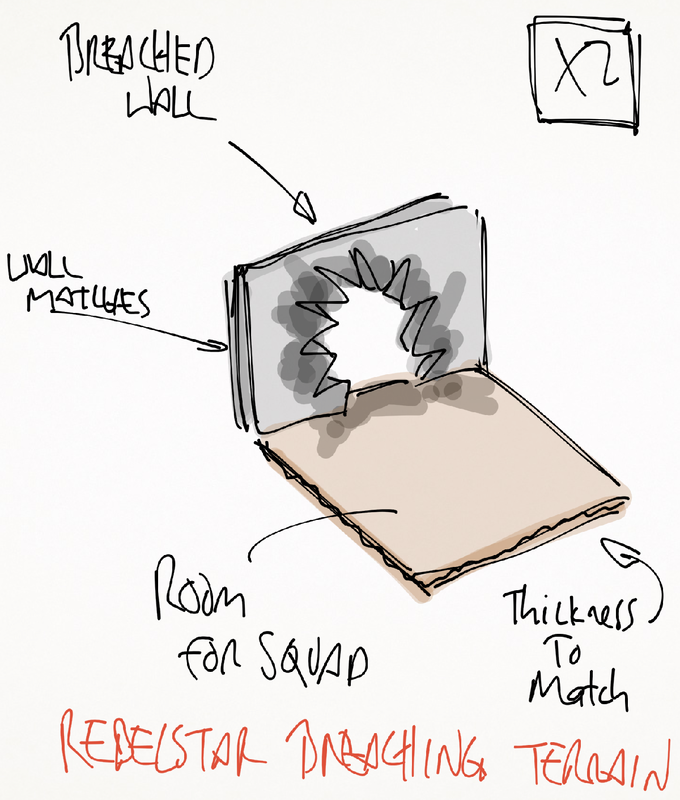 The tiles can be re-arranged in different configurations to make different locations. I'm also going to make (or buy) a hydroponics section for one open location and a garden for the other as well as sourcing some fuel or water tanks since these all featured prominently on the Rebelstar map. I have lots of interior scenery items already but I'll be getting some more that are Rebelstar specific. Specifically an armoury and a medical facility. Most of this is coming from Ainsty. 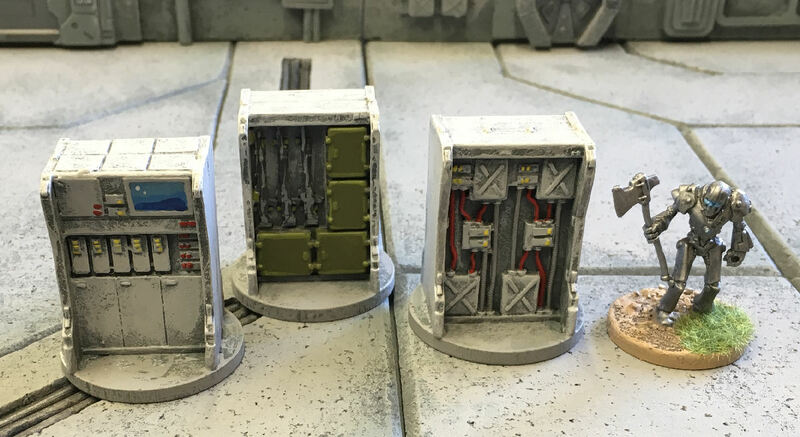 I'm going to construct some breaching tiles that will fit outside the three by four grid that the Raiders will deploy on before they begin their assault. The majority of the miniatures are going to be Reaper Bones figures. 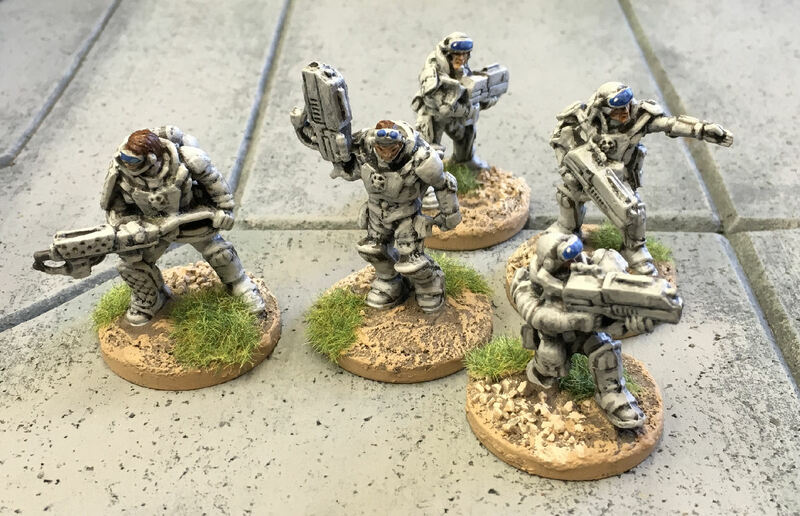 I'm going to use their Blackstar Corsair range for the Raiders and their IMEF range for the Operatives. 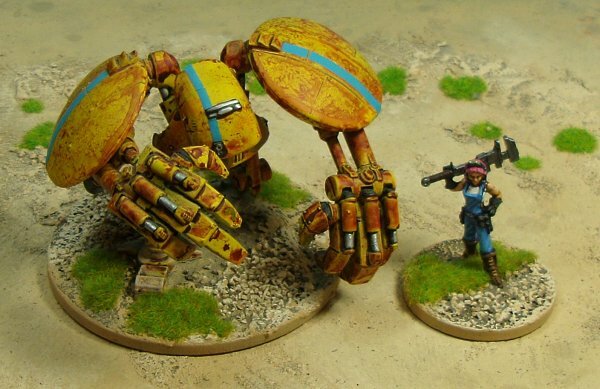 The Raider's Breaching Robots are going to come from Oathsworn (currently unavailable so I'm glad I got some when I did). 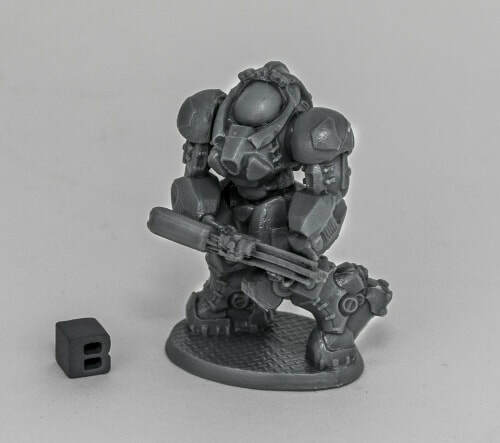 The Operatives are backed up by some servo droids which will be Reaper Tin Men, sentry droids which will be Scotia Grendel Kryomek turrets, Zeekers which are little drones that I haven't decided on miniatures for yet and a Miner droid that is going to be an Alpha Forge monster (see below). My initial order of Reaper Bones miniatures arrived and I realised I'd made a mistake. I thought one of the Corsairs was holding a large gun suitable to represent a Photon gun, a necessary support weapon for each Raider squad. It wasn't. 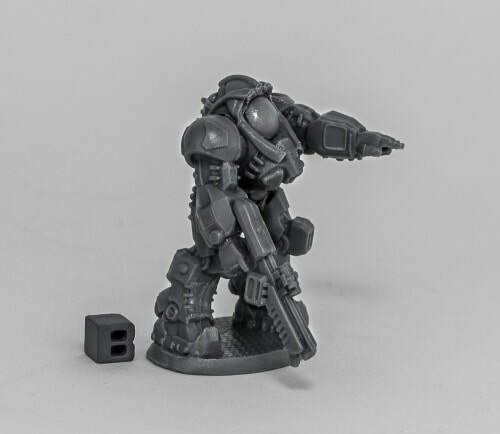 This involved a major re-think and eventually I decided that the IMEF miniatures are going to be the Raiders with the third (reinforcing) squad made up of Corsairs without a Photon. 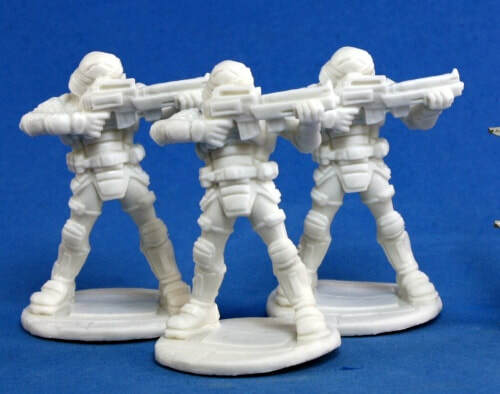 I've ordered some Reaper Bones Nova miniatures to be the Operatives. 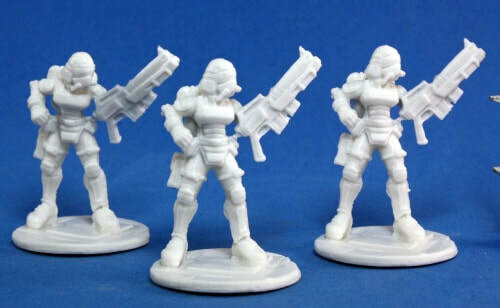 The Nova miniatures have two female poses which is good, but the Operatives don't have any women in their squads. This involved a slight re-write of the rules to make some of the Operatives women. Eric became Erica etc. 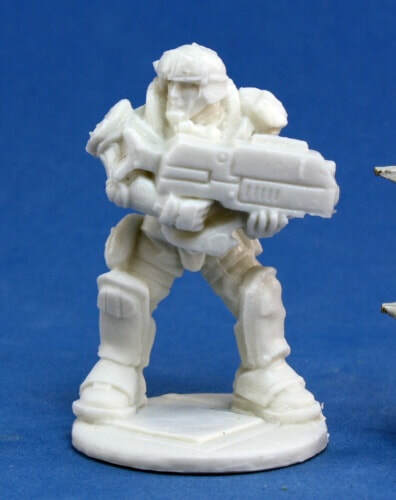 Likewise, the IMEF have no female miniatures but the Raiders have several women fighters. Another quick re-arrangement saw all the women grouped in the reinforcement squad where differences in shape are covered by the power suits as I'd originally intended. Corsairs. I thought the one on the right was carrying a bigger gun. But what I thought was the barrel extension is just his foot. IMEF trooper with a Photon. 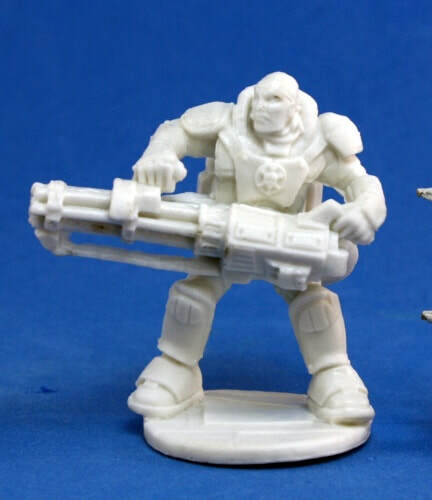 This miniature on the left is my choice for the Operative's Photon gunner. 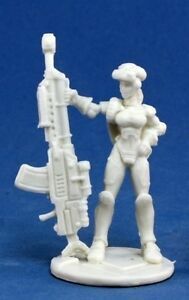 Bizarrely she's an IMEF miniature but doesn't match the others at all in style. 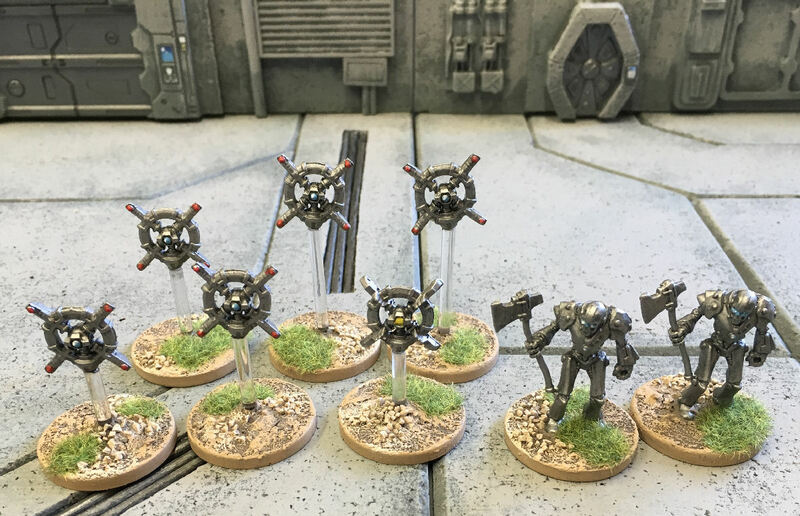 Here are my Zeekers from Warlord Games and my servo droids from Reaper. I've written a set of rules. Version 1.1, untested and unformatted is presented here. ​Below are examples of the double-sided combatant cards with placeholder artwork. Rebelstar cost £1.99. I played this game with Mike Broadbent in two-player mode for countless hours. A game would usually take about four hours to complete and, when the first one was over at about midnight, we'd often go again despite having to go to work the next day. The Rebelstar Raiders Moonbase map. The Starlingale. 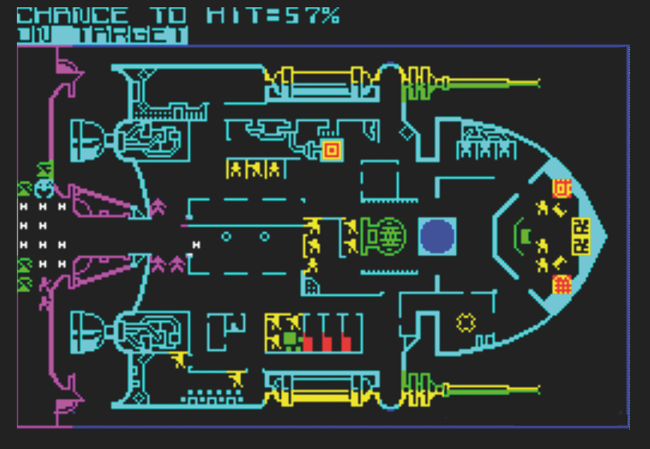 If you successfully defended the ship it scrolled off the screen to the right at the end of the game which was exceptionally cool back then. Rebelstar Raiders Final Assault map. 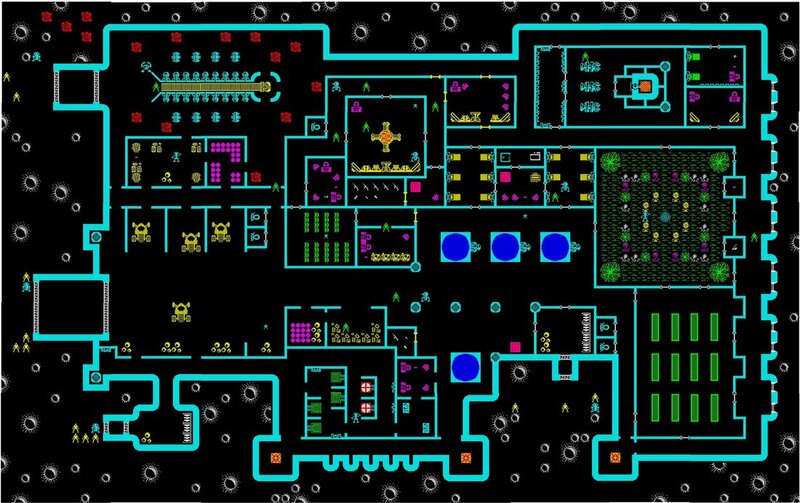 The Rebelstar Moonbase map from the Atari version (which I haven't played). The changes to the Moonbase are interesting if you're only familiar with the Spectrum version. You can enjoy Rebelstar today on your mobile device or windows machine thanks to Spectaculator. These are screenshots from my iPad. Some resin scenery from Ainsty. First up the Main Computer and a couple of medical scanners. 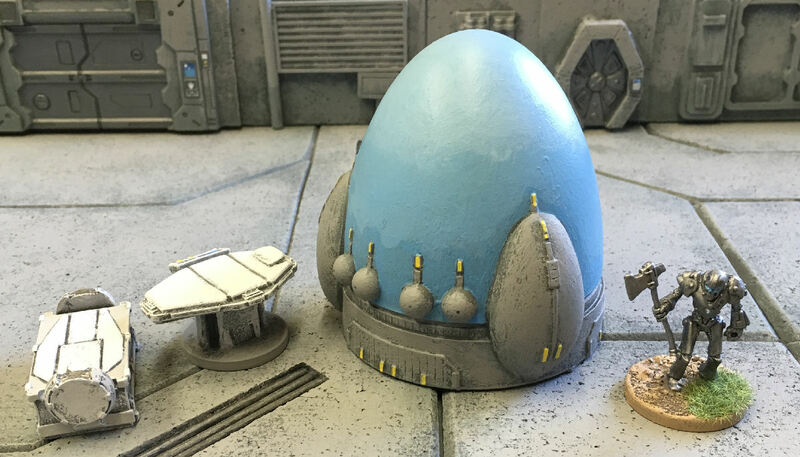 The Droid Control Station, the Armoury and the Defensive Shield Station. The conveyor belt, some tanks and a pair of small generators. Water coolers to represent the coffee machines.